Robin joins Sheffield for the play-offs having been released by Rye House who wanted to sign Robert Lambert. Robin has plenty of British experience having won the Premier League with Newport in 2011 and also ridden for Berwick and Rye House, and also Swindon in the Elite League. Back home he has experience with Njudingarna, Lejonen and Elit Vetlanda, and also this year with Dackarna. With his Premier League average dropping to 5.03 he will be spending September riding at reserve with Paco Castagna which could be interesting. Local lad Josh made rapid progress when he got his first 125cc speedway bike in 2010. Progressing quickly onto a 250cc he rode in the 250cc world championship in Sweden. In January 2012 Josh got his first 500cc, joined National League Mildenhall and finished the season with a 5.30 average. After joining Scunthorpe to replace the retired Garry Irving at the start of 2013, he became the scapegoat of an under performing team and lost his place to Lewis Blackbird before he'd done sufficient meetings to get an official average. His National League form was much better as he added over 2 points to his average helping the Fen Tigers to a NL Grand Slam and was named "Rookie of the Year". He joined Elite league Swindon for 2014 but persuaded Alun Rossiter to release him after his uncle joined the new promotion at Owlerton. He went on to become British U21 champion at Wolverhampton and made steady progress with the Tigers in the Premier League. Josh gained a wealth of experience over the winter in Australia and continues to make goood progress riding for both the Tigers in 2015 and Wolverhampton in the Elite League. He also had a brief spell with National League Birmingham in July, all great experience for the youngster. 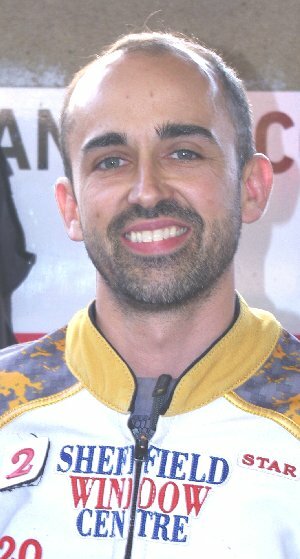 David was a member of the League championship winning Glasgow team in 2011 before joining Berwick for the last three seasons during which time he helped them to victory in the Four Team Championship in 2012. In his two visits to Owlerton last season David scored 30 points plus one bonus from 12 rides (including one retirement) for an average of 10.33, and he reached the semi-final of Ricky's Big Day ahead of riders such as Scott Nichols, Kenneth Bjerre, Kenneth Hansen and Peter Karlsson. David thrilled the crowd with last to second moves passing Steve Worrall and Ludvig Lindgren in both heats 13 and again in 15 in the League Cup win against Newcastle. He was caught up in the horror crash in heat 15 at Rye House when his skipper took a tumble right in front of him resulting in a fractured hip. Thankfully David returned to track action in June and continued in the same exciting style. Ashley rode for the Tigers on-loan from parent club Scunthorpe in 2011. He returned to help the Lincolnshire club to championship success and also won the National League riders championship in 2012. Ashley doubled up with Swindon in 2013 and suffered a broken wrist at a vital time as Scunthorpe contested the play-offs in 2014. After struggling with machinery Ashley was picking up some form when he became a victim of the track conditions at Glasgow in the League Cup semi-final. A crash left him with a badly broken shoulder which means his season is over. 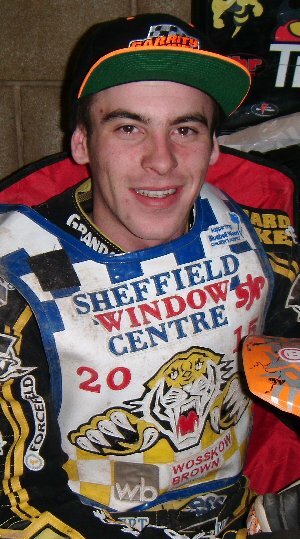 Just thirty years (almost to the day) after Sheffield attempted to sign his father, Paco Castagna joins the Tigers to replace injury victim Ashley Birks. Paco finished second in the Lonigo round of the Italian Championship last year ahead of Erik Riss and Nico Covatti, and he's probably best known for his appearance as Italian reserve in the Speedway World Cup round at King's Lynn. Paco has been keen to find himself a British team and we hope he manages more than the three meetings his father managed in his first season for King's Lynn. He scored a healthy 12 points in the challenge against Cradley and is scheduled to make his Premier League debut against Rye House. He doubled up with Poole in 2004 and won the controversial Premier League Rider's Championship crashing with the unbeaten Simon Stead in the final, but was unable to defend his title in 2005 after failing to make the semi-final. André returned to the saddle with a brief spell on loan at Glasgow in July 2013 before rejoining the Tigers to replace the injured Richard Hall. He started the 2014 season in the reserve berth but soon moved up into the team. Just as he reached peak form he crashed on the last bend in the televised match against Somerset and was hit on the head by a following riders bike. Thankfully he escaped serious injury but missed the rest of the season while recuperating. When Taylor Poole's visa application was rejected Andre became the obvious choice to complete the team. He started the season in fine style and was steadily building his average before sustaining a wrist injury at Edinburgh. 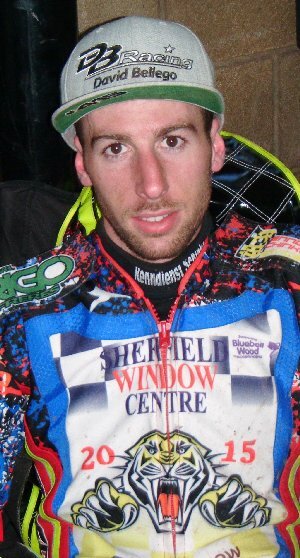 Jason was British U15 Champion in 2008 before joining the Buxton Hitmen in 2009. He was British U19 Champion and National League Riders Champion in 2011 while riding for the Belle Vue Colts and the Leicester Lions. For the last three years he has ridden for the Rye House Rockets and represented them at the PLRC in 2014 scoring 6 points. Unable to find a Premier League berth in 2015 Jason was concentrating on his Elite League commitments for Coventry until being invited to cover for the injured David Bellego. By the time David Bellego had recovered Ty Proctor had been deported for non-compliance with work permit regulations and Jason was able to take over his place in the team. Jason appears to be enjoying his time with Sheffield almost as much as the fans are. Nikolai was the Danish U21 Champion back in 2006. He rode for Wroclaw in the Polish League as a 17 year-old. 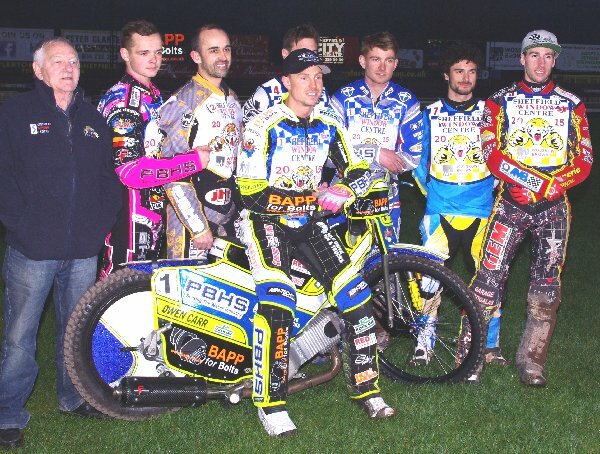 Since then he's ridden for Wolverhampton, Smederna, Swindon, Peterbrough and Birmingham. In 2014 he represented Leicester and Scunthorpe and this year he's a member of Elit Ventlanda in the Swedish Elitserien. He joins the Tigers to replace injury victim Andre Compton and help the Tigers in their quest for the play-offs. 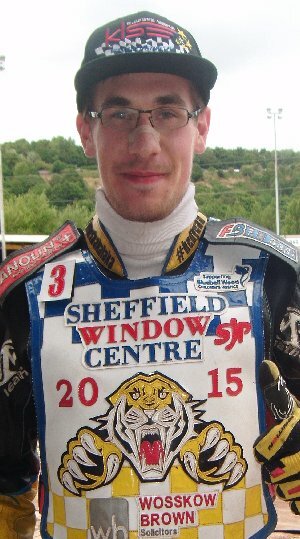 Ty's form was patchy in the Elite league with Wolverhampton in 2014 and he joined the Tigers with the hope of regaining some confidence, but he initially struggled to get to grips with the pacy Owlerton circuit. A maximum against the Rye House Rockets showed he'd turned the corner and he was already in double figures when he crashed in heat 15 of the Newcastle match sustaining soft tissue damage and a troublesome haematoma in his left thigh. With a temporary visa issued Ty had to prove he was of the required standard for the Premier League in 2015. Having achieved an 8.26 average (7.39 excluding bonus points) it turns out he has to include his 2014 meetings in the calculations and joins Taylor Poole on the list of unemployable Australians. Arthur rode junior moto cross before taking up speedway at the age of 9. He was Australian U16 champion in 2008 and 2009 and finished second to Brady Kurtz in 2010 before electing to take up road racing in the Red Bull MotoGP Rookies Cup. Three victories in 2011 at Jerez, Mugello and Assen saw him finish 2nd in the championship and gained him a ride in the Malaysian Grand Prix where he finished 20th. 2012 saw him join the Red Bull KTM Ajo team with whom he claimed a podium finish at his home Grand Prix at Phillip Island in October. After some disappointing recent results Arthur has decided it is time to try his luck back in speedway racing and a long time association with Neil Machin resulted in him joining the Tigers for 2015. After a steady if unspectacular start to the season Arthur showed his mettle in the challenge match against Cradley when he raced to his first ever maximum. In his best performance of the season Arthur raced to paid 14 at Berwick and set up a last heat decider. Tommy Johanssen fell in front of Arthur who had nowhere else to go and he collected a separated collar bone which threatens to end his season. 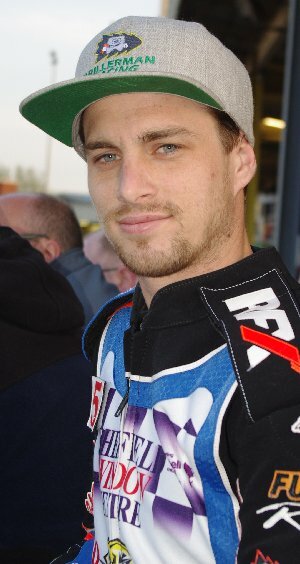 Simon returned to his home town club in 2013 but a badly broken leg in a crash while practicing at his Elite club King's Lynn made him miss half of the season. Good form in 2014 with both Sheffield and Leicester in the Elite league led to him being called up to represent his country in the Speedway World Cup. A magnificent 10 points at King's Lynn helped Britain qualify directly to the final for the first time in years. Simon, now a full Sheffield asset and doubling up with Belle Vue in 2015, started the season in fantastic form and led the Tigers to wins in all six opening fixtures including a rare away win at Rye House. Unfortunately in the last heat of that meeting at Hoddesden he clipped the fence while leading heat 15, somersalted back into the path of him team mate and suffered a broken femur and upper arm. Official meetings average in 2015 = 10.48 Maximums: (Paid) 2, (Full) 2.